Rainbow Gardens is a restaurant and gift shop in Ogden, Utah that I love to frequent. One of my favorite treats there is their Mormon Muffins. This recipe states that it must sit in the refrigerator overnight before baking, but I'm impatient and have baked a batch as soon as I prepare it and it works fine. I add different ingredients throughout the week to change it up. Chocolate chips, raisins, chopped apples, cubed mango, cinnamon, ginger - let your imagination go wild. Add soda to boiling water and set aside. Whip butter and sugar until light and fluffy. Add the eggs slowly. Mix well. Add the buttermilk, flour, salt and mix again. Add the soda water very slowly. Gently fold the cereals and the walnuts into the mix. Refrigerate overnight. 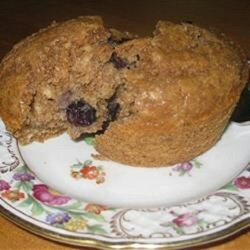 When ready to bake, stir mix and spoon 1/8 cup into greased muffin tins. Bake at 350 degrees for 30 minutes. Let cool for 5 minutes. Muffin mix must sit in the refrigerator over night before baking. Muffin mix will last one week, covered and refrigerated. Yields 3 dozen muffins.